I love roasted chicken. It’s juicy, well-seasoned, and healthier than fried chicken. 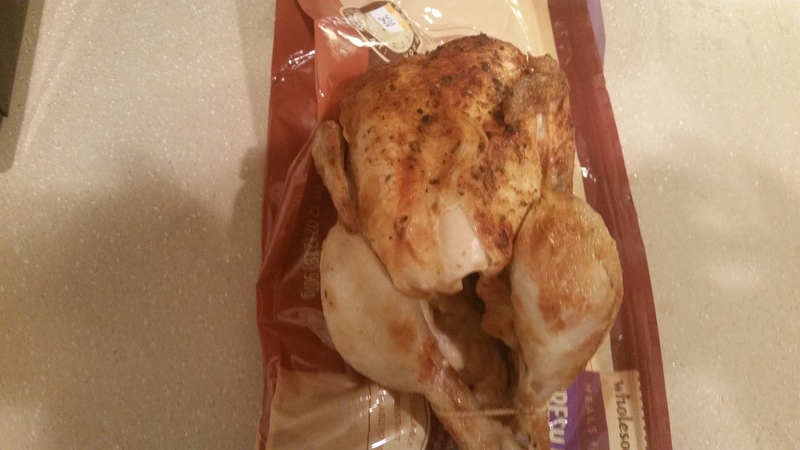 I usually pick up a whole roasted chicken like this at Kroger, Meijer or Giant Eagle. The only problem is the roasted chicken doesn’t look as if it’s fully cooked. Take a look at this pitiful looking bird. Where’s the crispy skin and look at that pale leg. Nasty and a real turnoff. 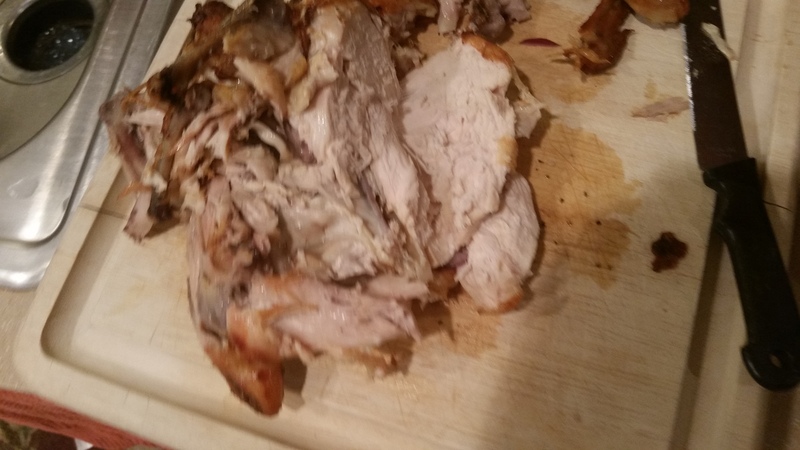 I was told the chicken looks like this because the stores roast the chicken up to a temperature, a temperature that indicates the chicken is cooked even if the skin isn’t brown. What’s even worse is the meat is pink inside. 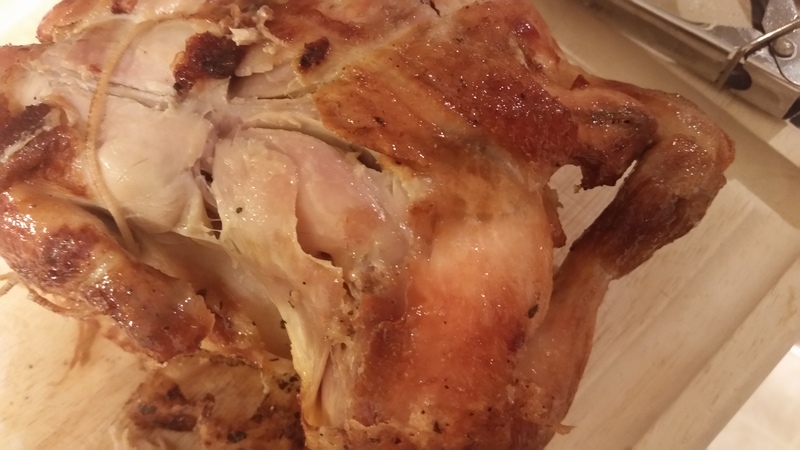 For a while, I stopped buying roasted chicken because it just didn’t look like it was done and that wasn’t appealing. 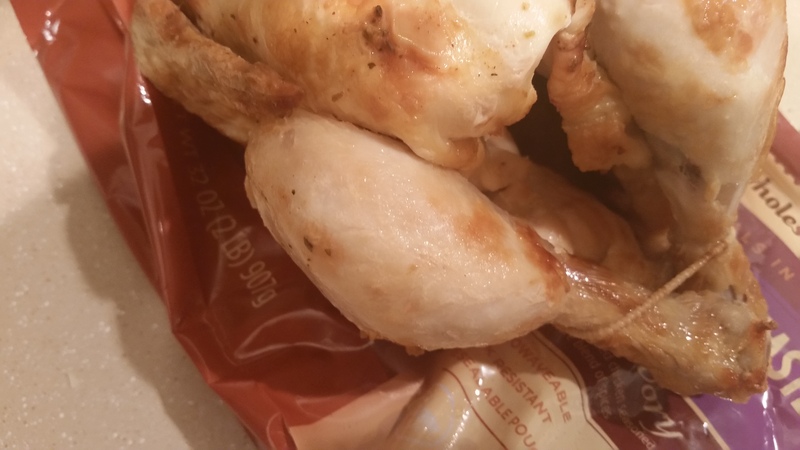 But I do so love roasted chicken so I recently started buying them again. However, I found myself throwing away most of the chicken or sticking it in the microwave because there was so much pink meat. Then it hit me. Why not cook the chicken myself? No. 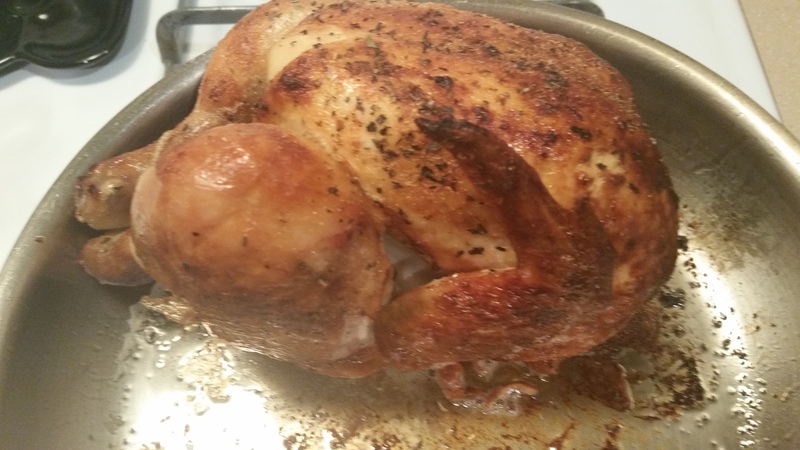 Not a raw chicken but a roasted chicken from the store. Here’s what I came up with. 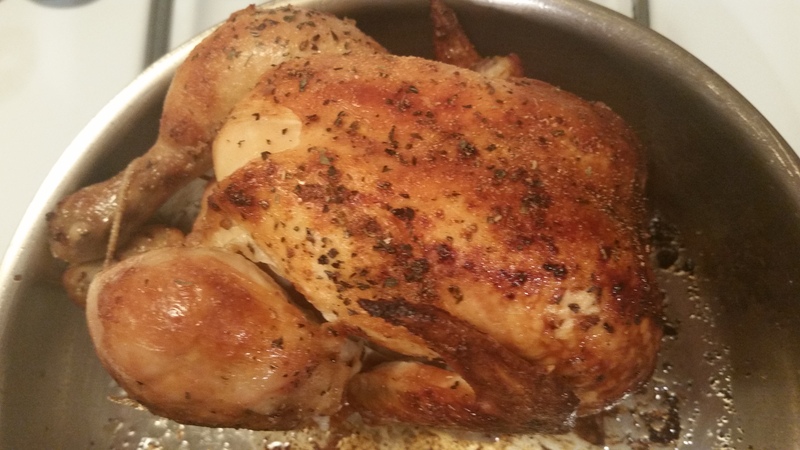 Put the chicken in an oven-safe pan. I’m using a stainless steel frying pan. I want my skin crispy so I patted on some butter and a little canola oil. Make sure you coat the bottom of the pan so the chicken gets nice and crispy underneath. Now you can add seasonings if you like. I like pepper and garlic powder. Stick the pan in the oven at 400 degrees. Every five minutes, check on it and turn if necessary and fifteen minutes later, you’ll have this. 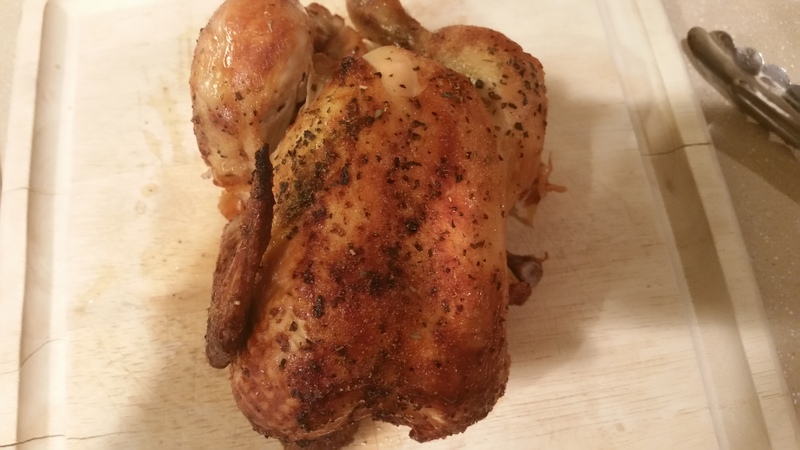 The leg has color as well as the rest of the chicken. Look at that crispy skin. And the meat is still juicy inside. Check out the underside. It’s usually soggy with flabby skin. This is succulent and crunchy. 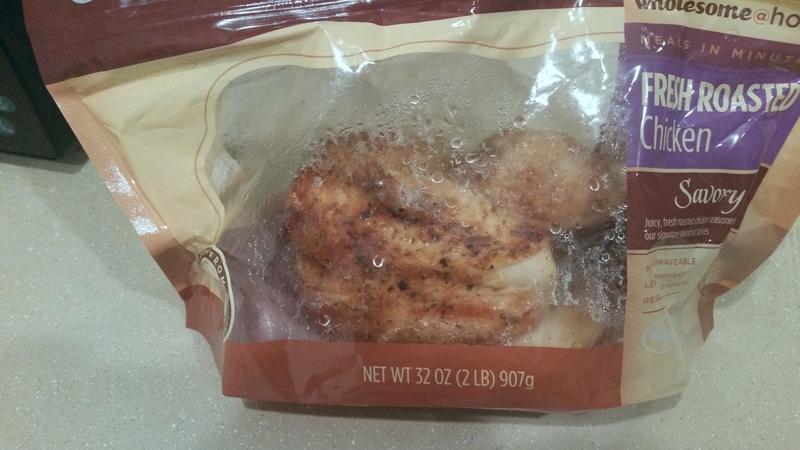 I love to cut up the chicken and put it in a container to grab and use throughout the week. I use it on my salads, shred it and add barbecue sauce, and make chicken sandwiches or chicken salad. Give this trick a try and let me know how it works for you. Previous Post It’s Time For a Cleanse!! !